These 7 crafts should at least fill the first week of summer vacation with the kids. After that, who knows? 5. Lemonade Stand from Oh Happy Day! Freezer paper stencils are easy and satisfying–the lazy girl’s way to silkscreen. Freezer paper has a shiny side that irons nicely onto fabric and then peels away easily, leaving a crisp, clean image on your fabric. Freezer paper is available at many grocery stores. 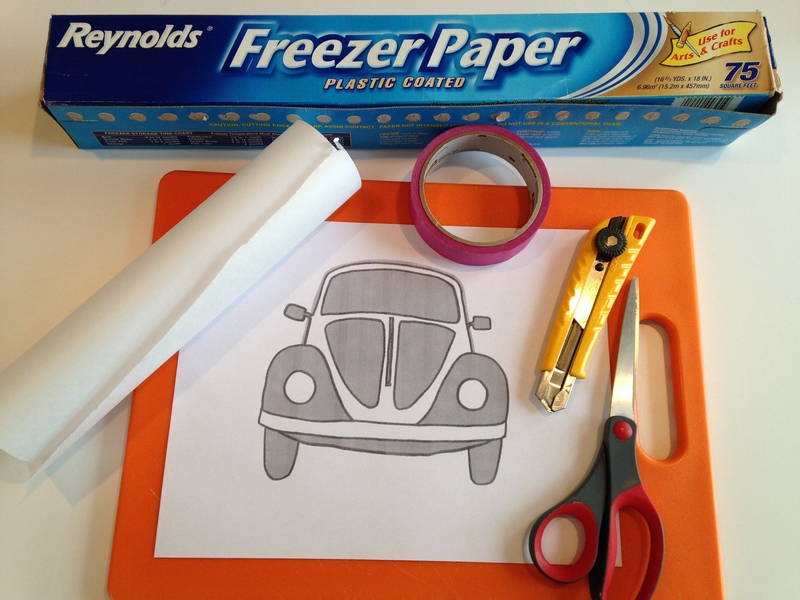 Leave a comment if you use this VW Bug stencil and please send a pic–I’d love to see your results. 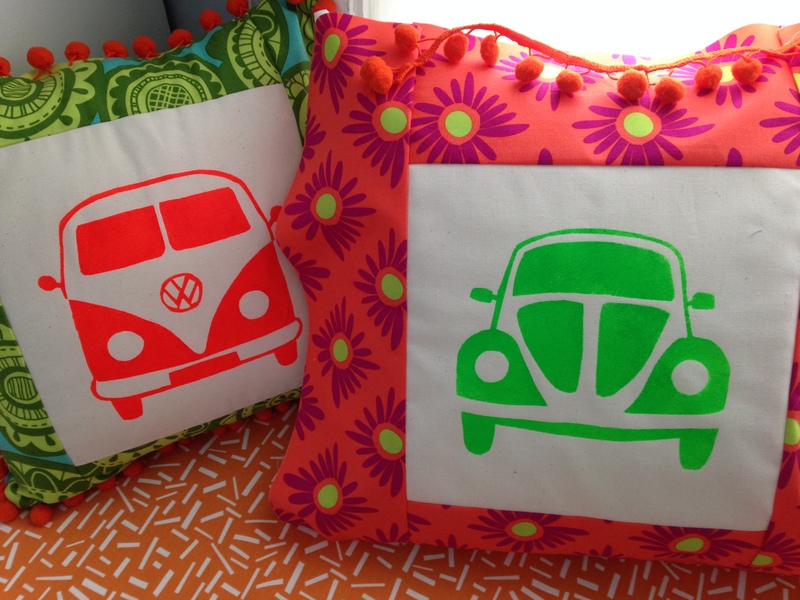 Next, I’ll share the pattern for sewing the VW Bug pillow (complete with groovy pompom trim)! It ain’t done yet! This is an anticipatory photo in which I revel in possibilities without actually completing the sewing. Those same possibilities stall me: orange pom poms or green? Orange wouldn’t provide much contrast with the orange-y fabric but it would offer consistency with the VW bus pillow–also orange is available at my local fabric store. Green pom poms require a car drive into the Dreaded Land of Strip Malls. Magenta pom poms are another possibility (available locally, too). Zeke and his friend Rowan agreed that magenta would be OK. But Rowan has green hair, so can we trust him? See what I mean by stalling? VW bus pillow complete! Since I only had a fat quarter of border fabric, I patch-worked the backing. Serendipity! I like the way it worked out. The pillow looks a little lonely on that window seat, though. Don’t you think it needs a friend? A VW bug pillow, perhaps?